It is believed Abraham brought single God worship to the world. Judaism (circa 1200 BC), Christianity (circa 30 BC) and Islam (circa 610 CE/AD) all have Abraham as one of their tenants. Abraham was asked by god to sacrifice is his son Isaac to God. There are two versions one where he did slaughter his son and the other is, he swapped his son for a Ram. 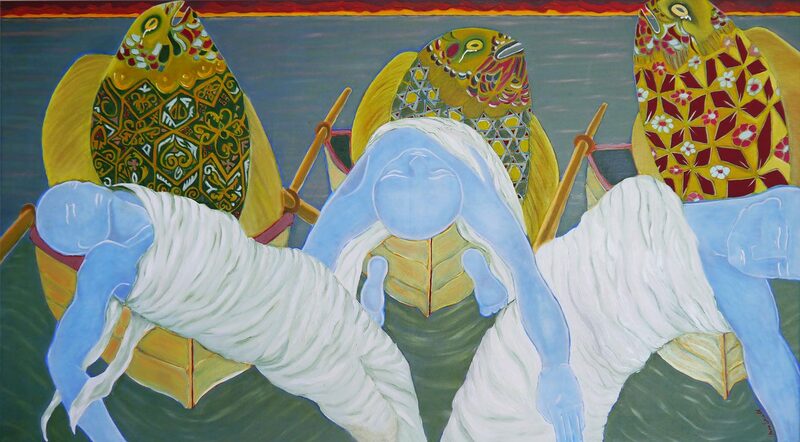 The midground: are three wailing mermaids in wooden row boats – representing the transition between life and death. The Mermaids: Hatmehit and Isis both fish goddesses from the middle east protected and transported the dead into the next life. Fish in Judaism keep evil away from the door, in Christianity it is a symbol of plenty, and Islamic faith depicts strength as it’s the fish that holds up the earth. Wooden boats: Are a symbol of carrying this life to the next. The midground: The sea is flat and has a metallic quality representing the layer of oil spillage from the wars in the middle east. Background: Storm clouds created by burning oil and fire also represents damnation / wrong doing. Reworking: I sat with this artwork for thirteen years I loved and hated it. I decided this year to do some gentle reworking to soften the colour pallet.